Harvest Season: June to mid-July----- Color of fruit at maturity: Yellow, Red, Crimson----- Size lbs: 3/4 - 1.5----- Fruit Production: Consistent extremely heavy bearer.----- Growth rate of tree: Fast----- Height of mature tree: 50 feet----- Eating quality (as provided by the experts at Fairchild Tropical Gardens, Miami, Florida): Good to Excellent----- Fiber content of fruit: Abundant----- Miscellaneous: Haden is a seedling of Mulgoba, planted in 1902 in Coconut Grove, Florida. 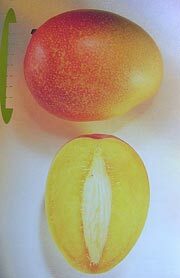 In 1910 it fruited for the first time and was the first selected and named superior mango cultivar in Florida. The harvest season is very short, lasting only 3 weeks. 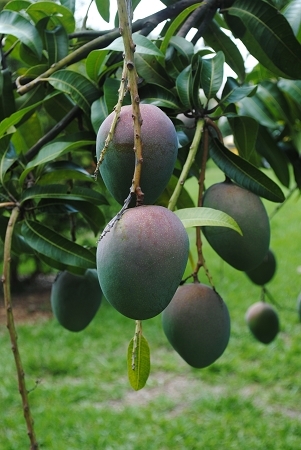 Full sized trees can easily produce 2,000 fruits at harvest.